Sudden Death Over Time does what only good satire can--tear down the artificial and the irrelevant to get to what is human. The stories are funny, insightful, disturbing, sad, and always entertaining. They emerge from the uncertainty of our time, amid failing infrastructures, moral ambiguity, corruption, and tenured disinterest of an academic system that perhaps like our political system needs to slough its skin and renew itself every ten years as Thomas Jefferson once suggested. Rember's talent in bringing interesting characters to life and letting them stumble on their humanity in places at the same time common and extreme give these stories an energy that sparks on every page until they conflagrate into a controlled burn. ​"John Rember tears your heart out and replaces it with his own. No one I know of comes close to his mastery of the short story. Read him and weep." "I couldn't get enough of the stories in Sudden Death Over Time. John Rember's wit is as sharp as the edge of a well-hone ski and his prose is as smooth and perfect as a Dean's finest scotch. Reading these stories made me feel as though I'd come upon Richard Russo and Thomas McGuane swapping smart and wicked tales in front of a hot pub fire with cold drinks in hand. The book is that skillful, and that funny." "Rember's deft touches, the concrete language and careful craftsmanship he displays discloses a powerful writer at the summit of his game, a wordsmith who knows how to spin a yarn in such a winning way that those who read his stories are carried along with ineffable ease, perhaps seldom aware of the simple beauty of the style, the prose, its concision: never a word out of place, never a phrase without its distinctive, unfaltering Rember rhythm. Sudden Death Over Time is consummate literature--a dazzling achievement." 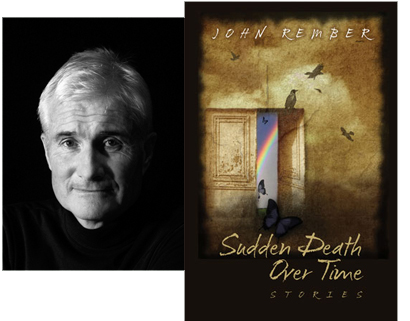 JOHN REMBER was born in Sun Valley, Idaho. He is the author of the story collections, Coyote in the Mountains and Cheerleaders from Gomorrah, the memoirTraplines, and the why-to-write book, MFA in a Box. For many years he was a professor of literature and writing at the College of Idaho and in the Pacific University MFA Program. He lives with his wife Julie in the Sawtooth Valley of Idaho.